// Make an image out of the population attribute and display it. If the features overlap, specify a reducer to indicate how to aggregate properties of overlapping features. In the previous example, since there is no overlap, an ee.Reducer.first() is sufficient. As in this example, pre-filter the data to eliminate nulls that can not be turned into an image. The output should look something like Figure 1, which illustrates the distribution of population by county in the US. Like all image-outputting reducers in Earth Engine, the scale is dynamically set by the output. In this case, the scale corresponds to the zoom level in the Code Editor. Figure 1. 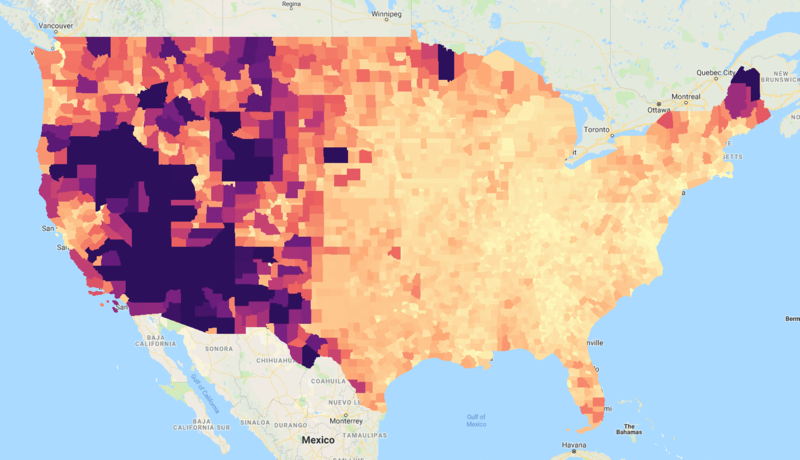 The result of reduceToImage() using the ‘Census 2000 Population’ property of the US counties FeatureCollection.